Welcome to Los Angeles Sparks social recap page! Check here often as we highlight all of the social media activity and posts from your favorite players! Riquna William was named Euroleague Women Top Performer of Game Day! We see you Riquna! Hi #ChefNek, let us know when we can get your cookbook! Candace and guests make an memorable visit to the location where Dr. Martin Luther King Jr. was assassinated on MLK Day. To stand on the balcony of the Lorraine Motel, in Memphis,on MLK Jr.’s birthday weekend, where MLK Jr. was assassinated was impactful, emotional and inspirational. This man died because of a belief SO strong. A man that stood for nonviolence was killed. An individual so strongly believed in racial equality to give his life. Obvious to some now, but at the time, what he was fighting for was disputed, argued and not allowed! The argument continues and although we haven’t reached the mountain top in many different ways (race, gender, sexuality), the needle is moving. I hope all of you can at some point visit the Civil Rights Museum and ask yourself, are you on the right side or the wrong side of history TODAY? “In the end we will not remember the words of our enemies but the silence of our friends.” -MLK Jr.
Chelsea Gray stopping by to remind everyone she’s coming for you in 2019. Karlie Samuelson has been in Belgium lighting it up in the Euroleague. Check out this photo Alana Beard posted on her IG of herself and Diana Taurasi. Nneka Ogwumike made her debut with Guangdong in China and she’s ballin’ as usual. Possibly the best #10yearschallenge around. Candace with her Madonna impression! Nailed it right? Essence with the throwback jersey reminding everyone of her 2019 aspirations. Happy New Year from Maria! Maria wanted to show us her squad in Russia. Alana returned to some familiar settings where she was, get ready everyone, the first woman to win the John R. Wooden, State Farm Wade Trophy and Naismith Player of the Year Awards. She was Duke’s first National Player of the Year and three-time ACC Player of the Year and the first woman at Duke University to have her number raised to the rafters. WHAT?!?! You’re looking at the Chelsea Gray, MVP, and the Women’s Drew League champions. Candace on Players Only rockin’ the ugliest of sweaters. PlayersOnlyBaby #UglySweaters #MeAndGAMatching #YouCanSeeSmittyHeartBeat #MyGuys #ILoveMyJob Vote studio J (Smitty, GA, Me) or studio B (CWebb, Isiah, Kevin) who wore it better!? Candace has been fire as a broadcaster for the NBA. Here’s here with her pal Dwayne Wade. Be on the look out! Chelsea Gray and UNINTERRUPTED cooking something up. We spotted Maria but her Instagram account is in Russian! Can someone help us out? Хочу пожелать всем хорошего настроения и побольше солнечных дней этой зимой ❄️☀️ I want to wish everyone a good mood and more sunny days this winter. Anyone who knows Alana knows she’s all about swim safety! Had a great time chopping it up about sports and music with @therealearthquake & Quake House Radio at Kevin Hart’s @lolnetwork 😂. Definitely a pleasure to be at the crib. Karlie Samuelson sticking to her winning ways as she helped Great Britain’s national women’s team earn a trip to Euro Basket 2019. We’re going to EuroBasket 2019!! 😁🙌🏻 Also big congrats to @azania13 on your incredible career. You are a gem! Proud to have shared the court with you. Let’s go GB! 🇬🇧And also Happy Thanksgiving!! Thankful for my family and friends and opportunities like these! Essence Carson has been keeping busy in the studio and in the Women’s Drew League. Her and teammate Odyssey Sims have been putting up numbers in the league. Week 7 Players of the Game: Game#1 Amber Blackwell, Action: 11pts, 2stls , 1 stl Game #2 Michelle Miller, Runnit: 11pts, 5rebs Game#3 Chelsea Gray, Lady Cheaters: 11pts, 6ast, 4rebs, 3steals, 1 block Game #4 Essence Carson, N My Feelings: 18pts, 10rebs, 3ast, 2stls, 1 block Essence is our Player of the Week! Jantel Lavender celebrated her dirty 30 and it looks like she had a good time. Nneka Ogwumike reminded everyone to get out there and vote on November 6. We hope you did! Chelsea Grey loves Halloween and retweeted this dynamic duo dressed as her and Candace Parker. Odyssey Sims has been tearing up the Women’s Drew League and was named Player of the Week for two weeks in a row. Women’s Drew League Top Players, Week 3: Oddysey Sims, N My Feelings: 29 pts, 3 assists Courtney Ford, Runnit: 21 pts, 6 reb Tea’ra Laudermill, Action: 13 pts, 2 steals Ashley Ellis, Walking Buckets: 14 pts, 9 reb Congrats to Odyssey Sims for being selected as our See’s Candy Player of the Week for the 2nd week in a row! Steve Smith should know you got to step your game up when facing the GOAT. Essence Carson or to some of you, @pr3pe, dropped another track. Check it out because it’s fire! Candace Parker joined the broadcast crew for the Los Angeles Lakers and she was a natural. Did you wish Chelsea Gray, “Happy Birthday!” Go ahead if you haven’t, she’ll appreciate it. All-star Guard Chelsea Gray has been living her best life in the offseason but is also taking time to hold basketball clinics. Check out her social media posts to get involved. After putting in work with teammate Candace Parker and Lakers’ legend Kobe Bryant, Karlie Samuelsson heads to Beligum to play overseas. If you missed it, Spark’s All-Star forward, Nneka Ogwumike, got some new hardware to add to her collection. Ogwumike and Team USA took home the gold at the FIBA World Cup. Sparks’ fans won’t want to miss this event. Adidas is releasing a Candace Parker shoe and will be available to fans but Parker will also be engaging with her fans, going through drills and talking basketball. MY🌊HER🌊YOUR🌊 – WAVES ROLL IN AND THEY ROLL OUT. IF YOU THINK YOU’RE NEXT – YOU BETTER TRAIN, INSPIRE, AND CREATE. LAI AND I WILL SHOW YOU HOW AT ADIDAS CENTURY CITY ON 10/06 – CLICK THE LINK IN MY BIO TO LEARN MORE. Sparks’ sharpshooter, Sydney Wiese, will be playing overseas. She posted a teaser shot on Instagram recently. The WNBA’s 2017 and 2018 Defensive Player of the Year, Alana Beard, is staying busy and recently traveled to the Philippines to hold basketball clinics for the youth in part of the country’s effort to promote and develop sports. 😍😍😍😍😍 Thanks for the awesome video @sheilaconti ❤️! Los Angeles Sparks’ forward/center, Jantel Lavender, checking in and with her twin sister, Jazmine! 2018 Rookie Maria Vadeeva should be heading overseas to play in the offseason. Here’s a recent post by Vadeeva of her playing in Russia. In recent news, some NBA players told the media who their favorite WNBA players are and Portland Trailblazers All-Star Guard, Damian Lilliard, chose our very own, Odyssey Sims. He’s been a fan since her college days. The one and only Essence Carson joined us for a photoshoot. If you haven’t already seen them, check out Carson and her teammates on Los Angeles Sparks’ wraps seen on Metro subways and buses in Los Angeles. The iconic Nneka Ogwumike doesn’t stop working and after the culmination of the Sparks’ season she went straight to work with Team USA. The hard work paid off as she passed several cuts to make the final squad. Chelsea Gray held her second annual “Gray Matters Shoe Giveaway” at Safe Place for Youth in Venice, CA, giving away new and gently used shoes to the needy. Over 400 pairs of shoes were given away and even Jantel Lavendar and Candace Parker joined in on the fun. The off-season hasn’t stopped for your Los Angeles Sparks. Sparks superstar Candace Parker along with sharpshooter Karlie Samuelsson trained with Los Angeles Lakers legend Kobe Bryant going over footwork and fundamentals. Nneka Ogwumike was awarded the Seasonlong #WNBACares Community Assist Award presented by @StateFarm for her work various philanthropic work focused on the youth, female empowerment, and STEM education among others. The Sparks season came to an early end but that didn’t stop our players from being active on social media. 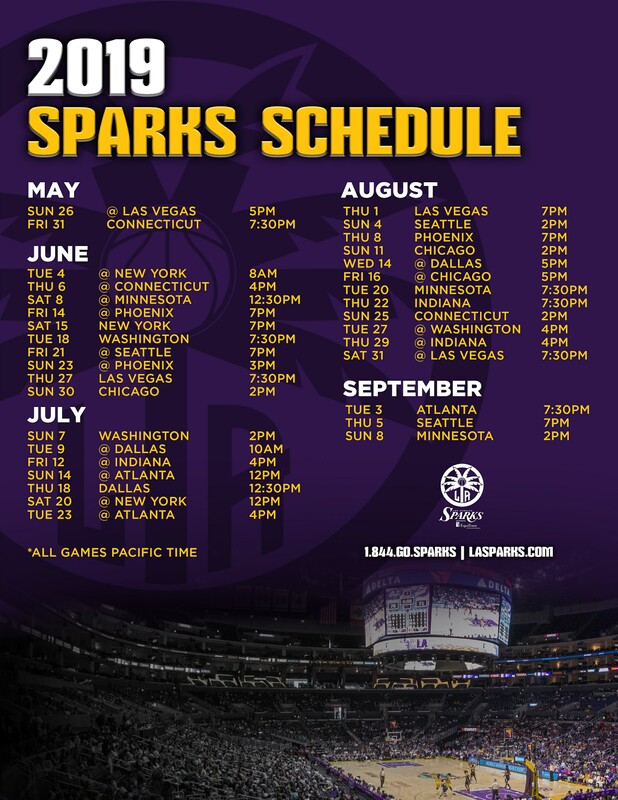 If anything, it showed Sparks’ fans there is no offseason. Candace Parker and Nneka Ogwumike weighed in on Instagram. After what was my most challenging season to date, all I am is grateful. A season whirling with debris couldn’t impale me, and never will. I certainly couldn’t have done it without support from family, friends, and fans. Thank you , LA. I’ll always be back and I’ll always rise higher. Parker also made an appearance on Lebron James’ The Shop on HBO. Parker spoke on being a mother and an athlete as well as other struggles she encounters. Basketball didn’t stop for Nneka Ogwumike and Odyssey Sims either. Both were invited for Team USA Training Camp in South Carolina in preparation for the FIBA World Cup. #MondayMotivation 💪💪💪 ・・・ 🗣 “We’re trying to win this medal.” @nnemkadi gets #USABWNT ready to WORK! Despite the early playoff exit, some good news came soon after. Alana Beard won back-to-back Defensive Player of the Year Awards and was named to the All-Defensive First team, more hardware to add to her collection. Congrats to @alanabeard of the @LA_Sparks on winning her 2nd straight #WNBA Defensive Player of the Year award! Stay tuned for more social media recaps from your favorite Sparks’ players and from around the league!